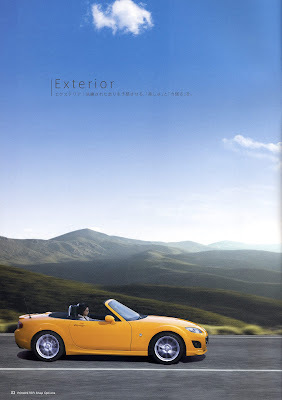 Customising your Roadster has always been part of the ownership experience. From the very first shop options accessory catalogue to the latest, Mazda has offered a wide range of optional extras for owners to choose from. 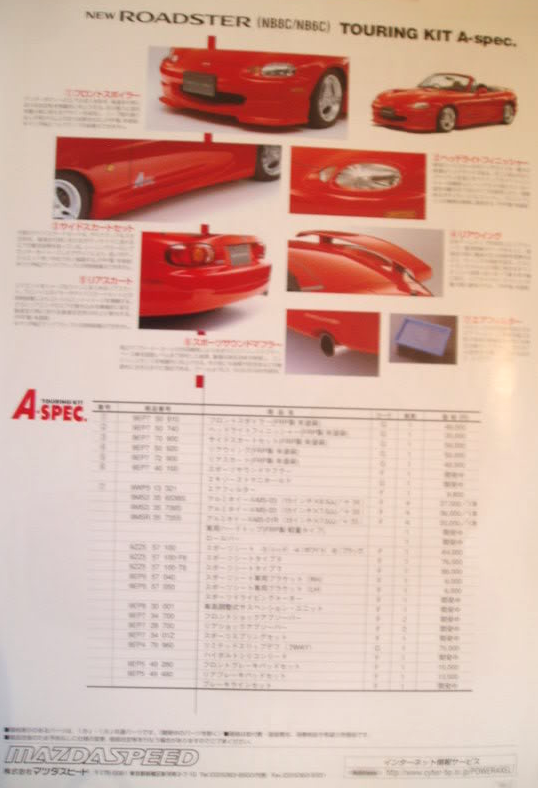 Of course, the aftermarket parts list is extensive for these cars and I'm not even going to try and compile a list of your options there! 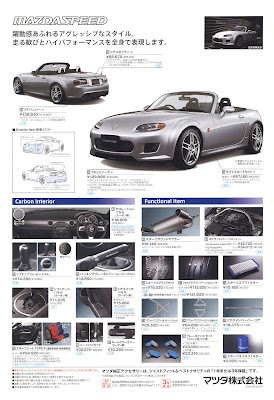 For now let's just take a look at some of the genuine Mazda parts you can add to your Roadster. 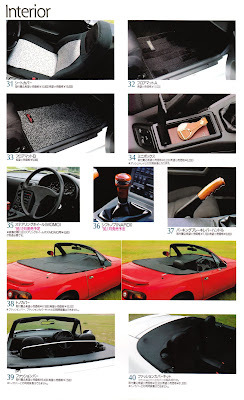 It makes sense to begin at the start, with the 1989 Shop Options catalogue. Here owners could choose from a selection of front and rear spoilers, some different designs of alloy wheel, uprated suspension and anti-roll bars, and a myriad of interior accessories. 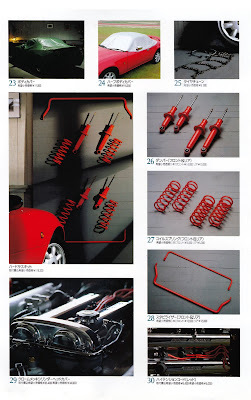 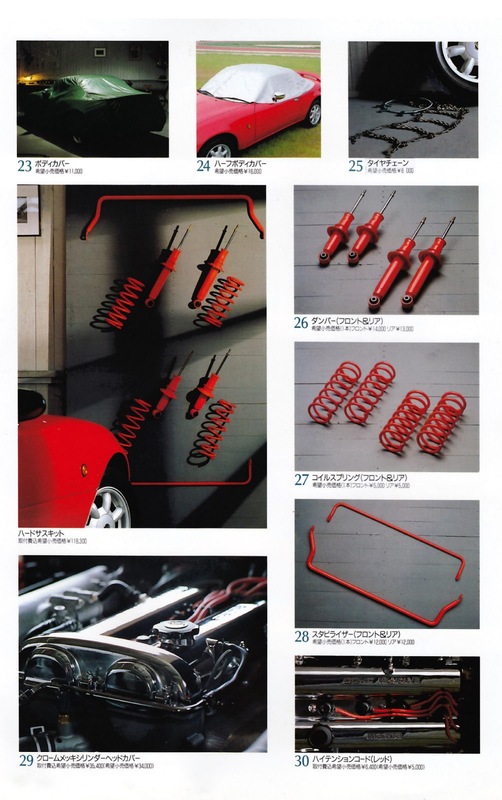 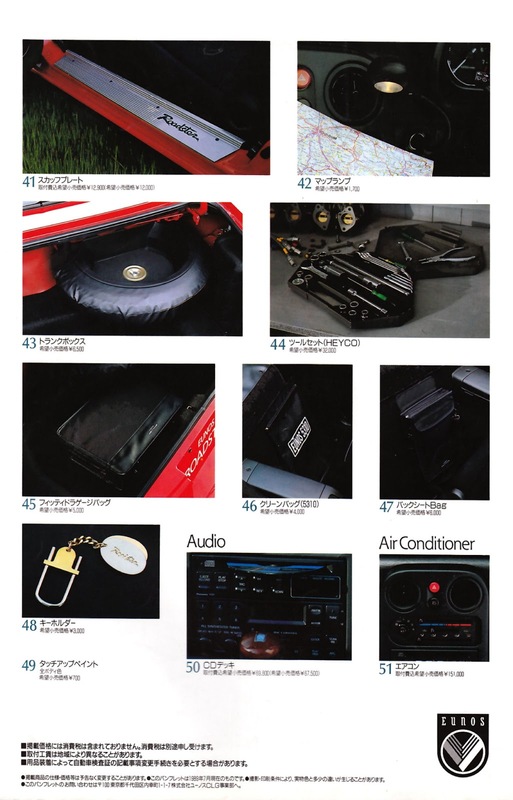 When the NB Roadster arrived in 1998 there was a nice selection of genuine accessories available. 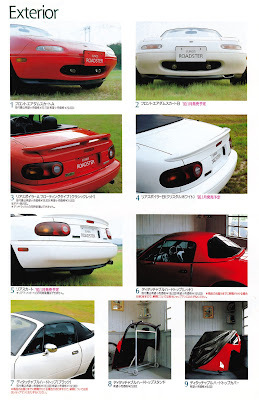 These included an aero bodykit consisting of a small front airdam with vents either side, side skirts which subtly followed the lines of the NB body, rear mudguards, and a small lip spoiler for the bootlid finished off the looks. Front foglights were also available in a small housing that required holes drilling in the front bumper, there were handy guide markings for these on the inside. 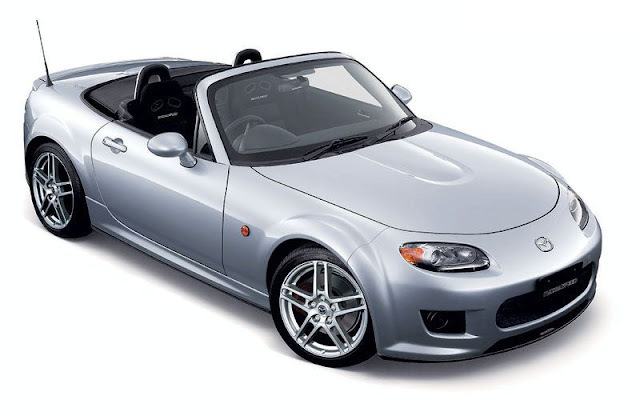 The facelifted NB Roadster brought with it a number of new customisation options. The change in design of front bumper required a new front airdam of a larger more aggressive design. 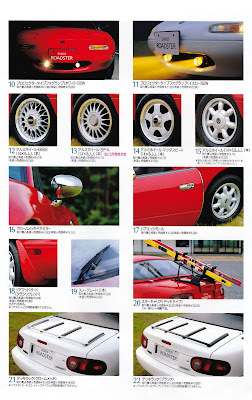 This also applied to the matching set of larger style side skirts which had a deeper more curved design than the originals. 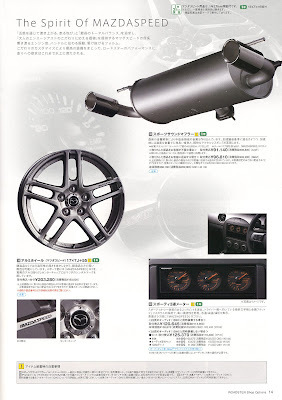 A new two piece rear under skirt was available which consisted of extended rear mudguards for either side. An adjustable two-legged rear spoiler was also offered, this was featured on the Mazdaspeed special edition. Of course, both kits could be mixed and matched and in Japan there were three appearance packages called "Enthusiastic", "Sophisticated", and "Vintage". 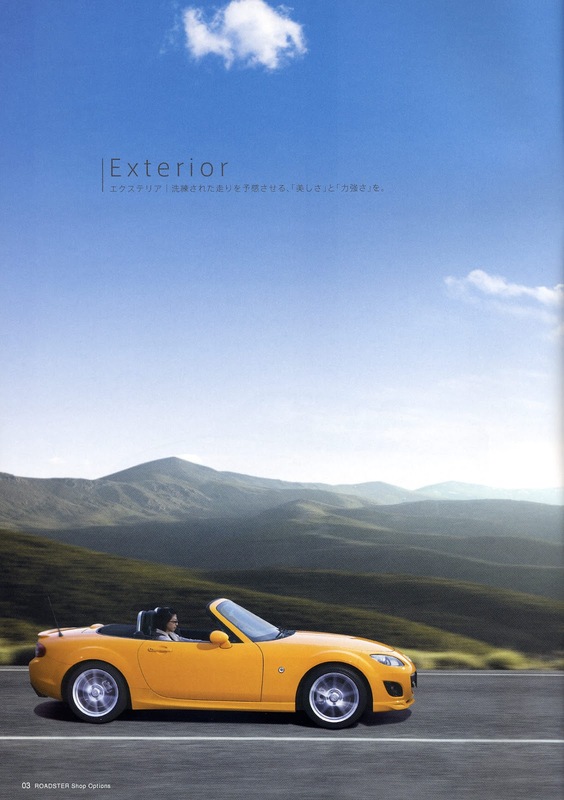 With the arrival of the NC Roadster, Mazda continued to offer many optional extras for the car. 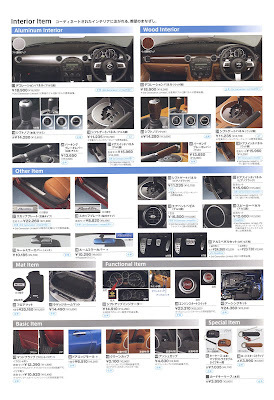 The UK accessory catalogue for example, lists 78 separate parts to choose from. The Japanese catalogue is even more extensive and continues the trend of either a vintage classic roadster look with tan and wood trims available, or a more modern sporty look with brushed aluminium and illuminated accents. Let's have a look at some of exterior and interior parts available for the original NC. 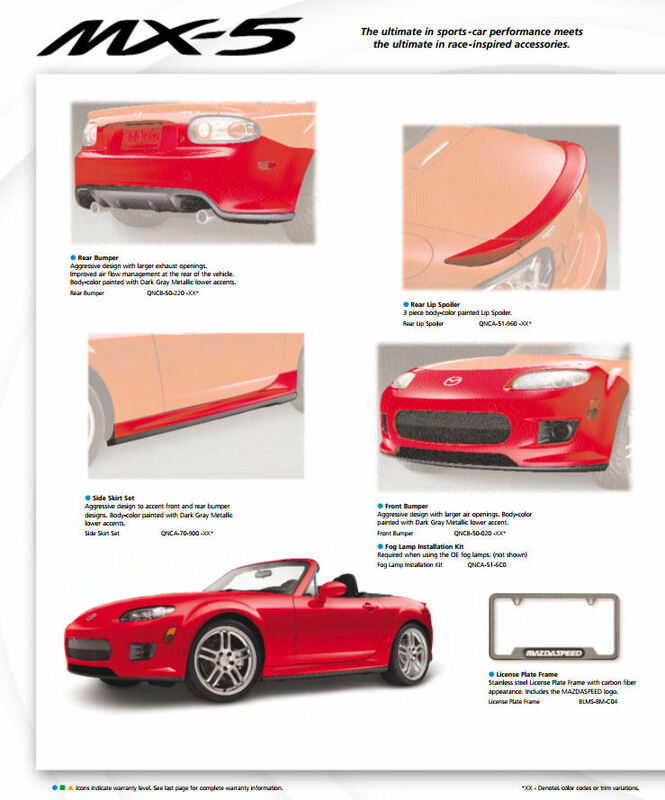 The appearance package for the NC1 includes a front lip spoiler, side skirts, rear skirt, and a small lip spoiler for the edge of the bootlid. 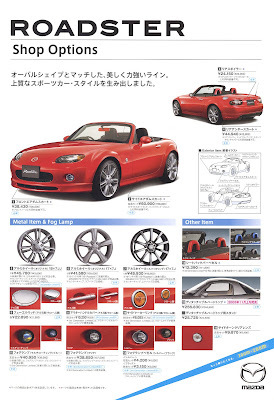 There was also a choice of alloy wheels available, including an 18" option to make the most of the large wheel arches. Other exterior trim parts included a choice of chrome or brushed fuel lids and door handles, chrome windscreen surround, foglight trim bezels, and colour coordinated trim for the roll hoops. 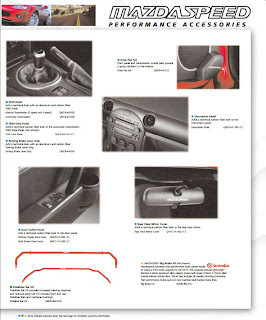 There were plenty of interior options too with colour coordinated dashboard trim panels available, stainless sill plates, pedal cover sets, and even an illuminated gearknob. 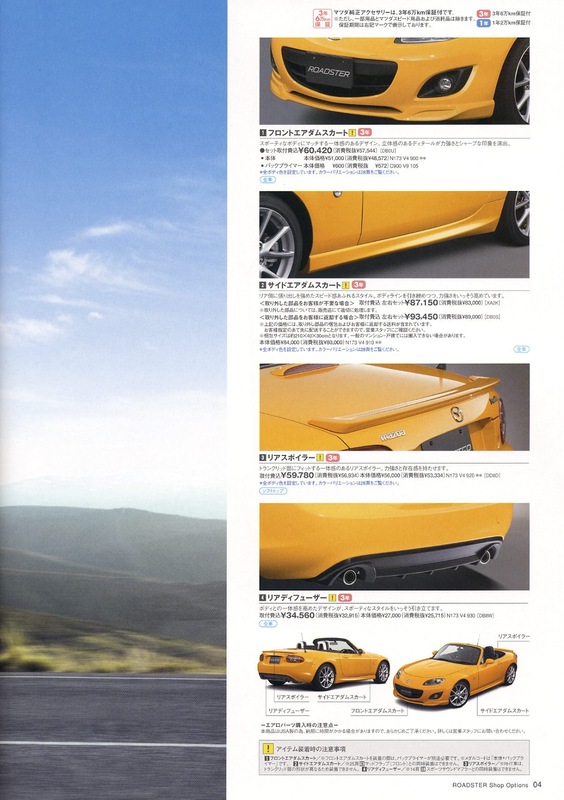 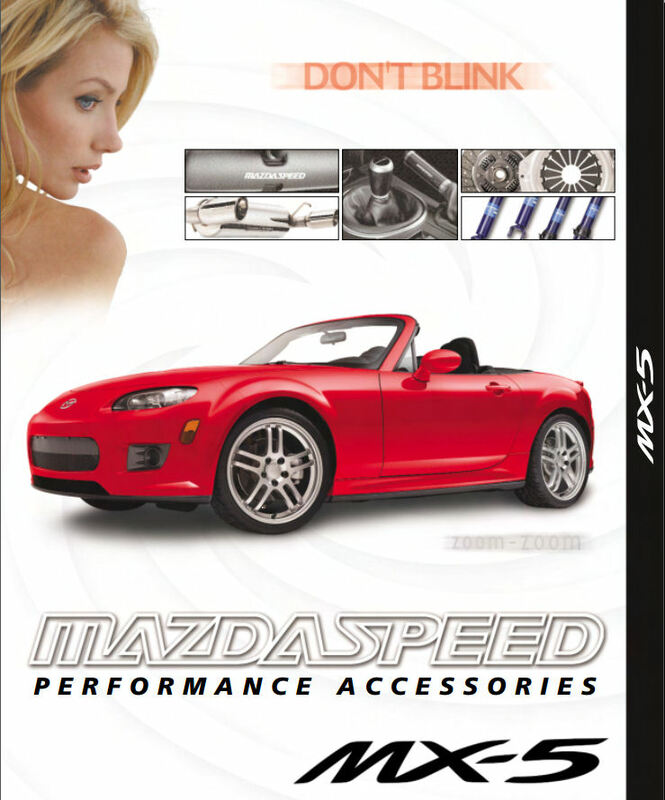 A comprehensive selection of Mazdaspeed parts was offered for the NC. 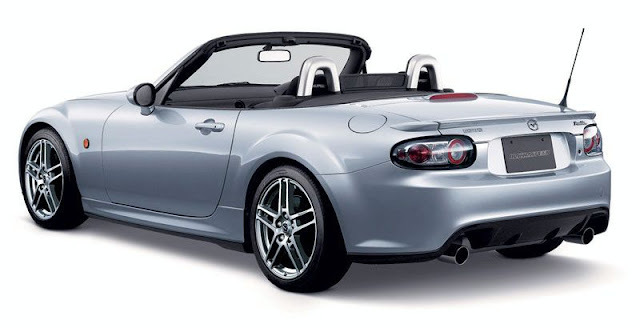 The most impressive of these is the bodykit comprising of complete replacement front and rear bumpers, a more impressive looking set of side skirts, and a wide 3-piece rear lip spoiler. 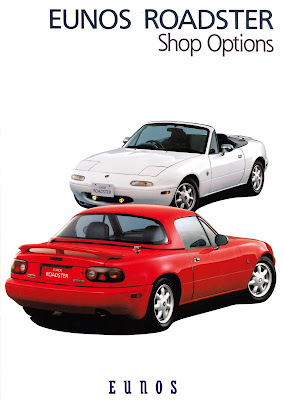 The front bumper totally transforms the look of the car giving it much more purposeful look and increased presence on the road. 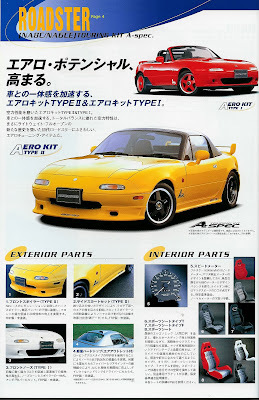 Not surprisingly in the UK this kit was a very expensive option, the full kit would set you back over £2300, making it fairly exclusive. Oddly enough for some reason the kit wasn't referred to as Mazdaspeed in the UK, instead it is simply called "Sporty". A smart 17" alloy wheel, bucket seats, sports exhaust, uprated brake pads, adjustable coilovers, uprated dampers and springs, chassis bracing, and some carbon fibre interior trim pieces were also available in Japan. 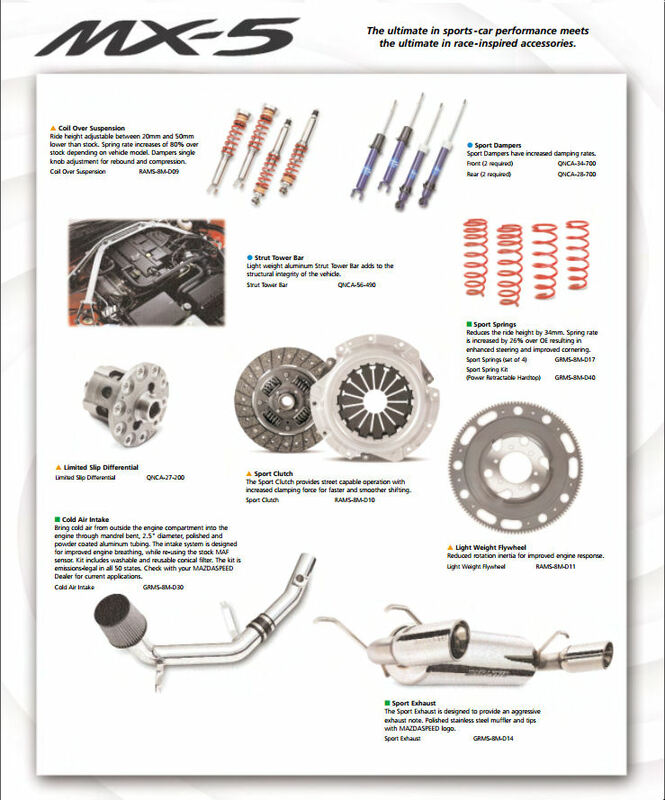 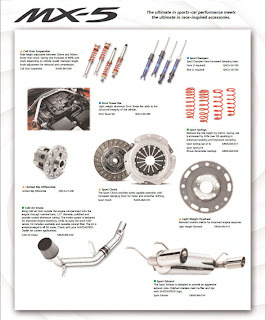 You can see the parts from the Mazdaspeed USA catalogue below, including the induction kit and the performance LSD, exhaust, clutch, and flywheel. The NC model's first facelift (NC2, or Mk3.5) arrived in 2008, bringing with it an update to the exterior parts on offer. A new front lip spoiler was available to complement the revised front end and headlights. 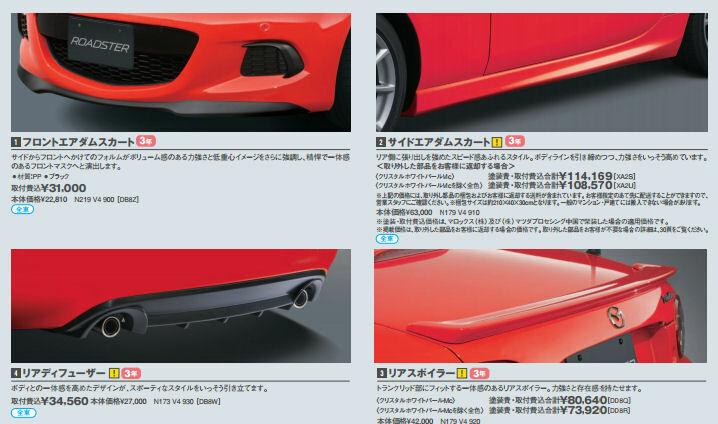 There were new side skirts to match the redesigned rear bumper, a slightly different shape rear lip spoiler with more defined edges, and a rear bumper piece giving the appearance of a motorsport diffuser finished the kit. 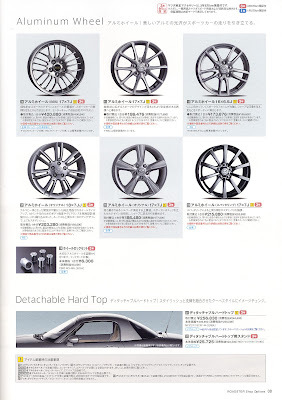 A broader selection of 16", 17", and 18" wheels was featured in this catalogue, including the BBS wheel from the Blaze and Prestige editions. Also shown here are various foglight bulbs, some silvered indicator bulbs to remove the orange from the light clusters, and the factory option HID headlight kits. 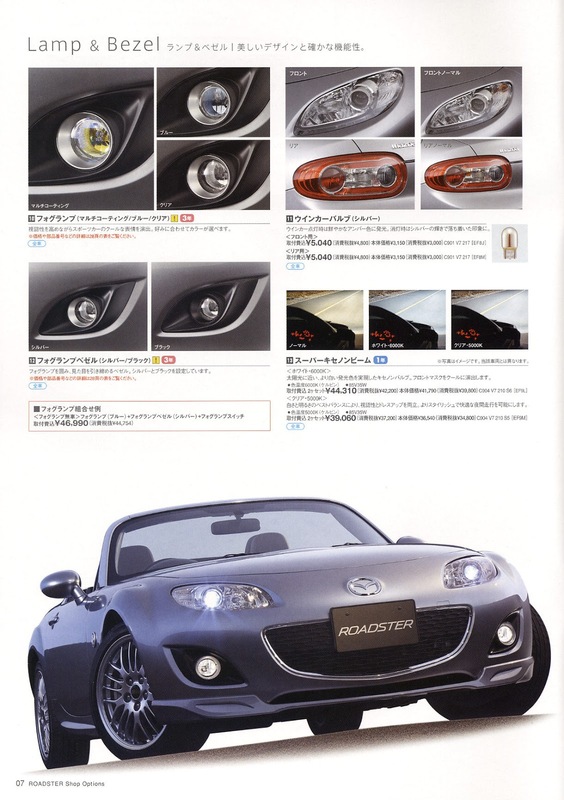 The Roadster received a second facelift (NC3, or Mk3.75) for 2013 to bring its front end in line with other Mazda models. 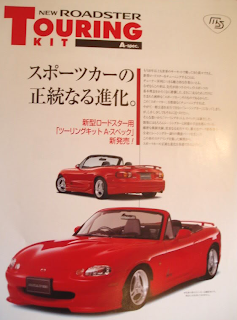 A new front design saw the foglight housings change shape and the lower edge of the bumper gained two winglets. For this revision a new front chin spoiler was available, with the rest of the exterior parts remaining the same.